A seminal film, Frankenstein Meets the Wolf Man (1943) brought together horror stars Lon Chaney, Jr., and Bela Lugosi as Universal’s fiercest monsters, paving the way for portmanteau Monster Rallies, eventually throwing Dracula, mad scientists and hunchbacked assistants, and even an Invisible Man cameo into the mix, culminating with Abbott and Costello Meet Frankenstein (1948) and leading to countless multiple monster films still essayed to this day, notably in the 2004 bastardization, Van Helsing. Universal’s ad campaign for Frankenstein Meets the Wolf Man was singularly dramatic, its posters dominated by a rip-roaring pulp-style painting of the two horrors having at it. 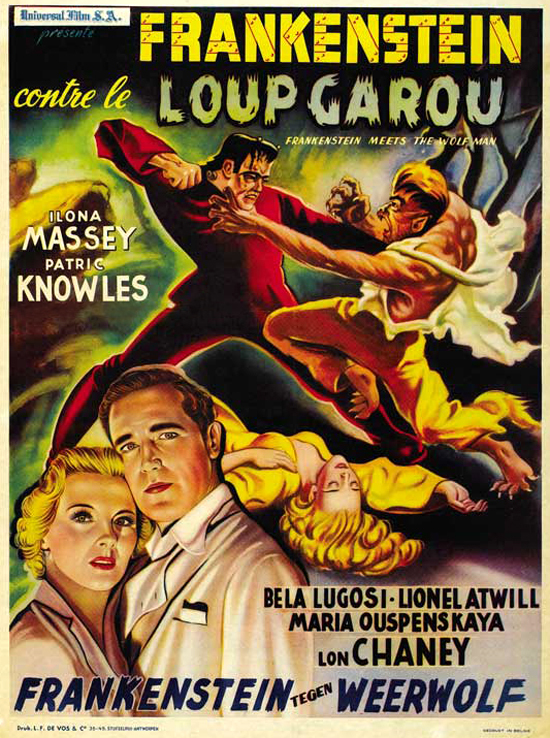 Here, a beautifully done Belgian version in French and Flemish reprises the monsters battling over a spilled blonde, with a tacked-on glamour clinch portrait of non-monstrous leads Ilona Massey and Patrick Knowles. The artist, unfortunately, is unidentified. The printer, L. F. De Vos & Cie of Antwerp, was a major publisher of books, and travel and film posters. Perhaps the company’s most famous contributor was René Magritte who designed a couple of straight, workmanlike movie posters during a make-ends-meet fling with commercial art in the mid-Thirties. Related posts about Frankenstein Meets the Wolfman. What a great movie poster.